These bars are delicious and not too sweet. The crumbly crisp crust is perfect with the slightly chewy center. 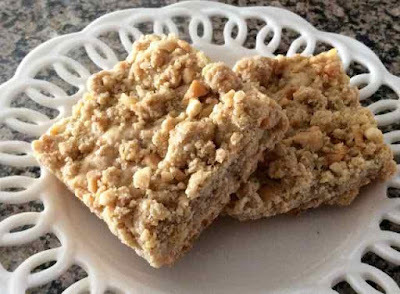 They are a bit addictive, but don’t let that keep you from making them because everyone will love these (everyone in the peanut butter loving world that is). I wanted to use up a can of condensed milk before it expired and searched for some recipes on the web. As usual, I converted a wheat recipe into a GF one. I am so happy with how they came out. I first tasted them warm and later fully cooled. It could just be me, but I think they are much better after they are completely cooled. Maybe it is because the crust is crispier once it is cooled. Enjoy! 1) Preheat oven to 350℉. 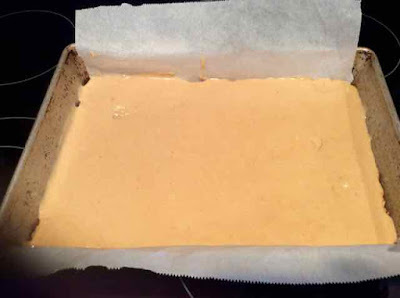 Prepare a 9” x 13” pan by lining it with parchment paper. This makes it easy to remove the bars and also protects the pan from cut marks if cutting them the pan. 2) In a bowl using a pastry blender or in the bowl of a food processor add the flours, xanthan gum, salt and brown sugar. Stir or pulse together until well mixed. 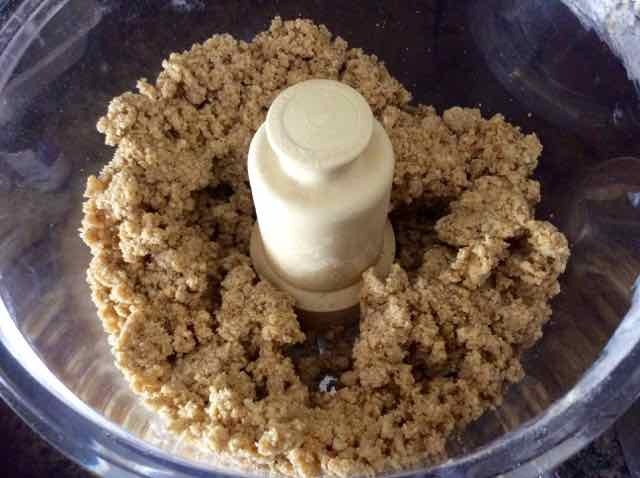 3) Add the pieces of cold butter and blend with the pastry cutter or pulse in the food processor until the mixture resembles coarse sand. Pieces of cold butter in the flour mixture. 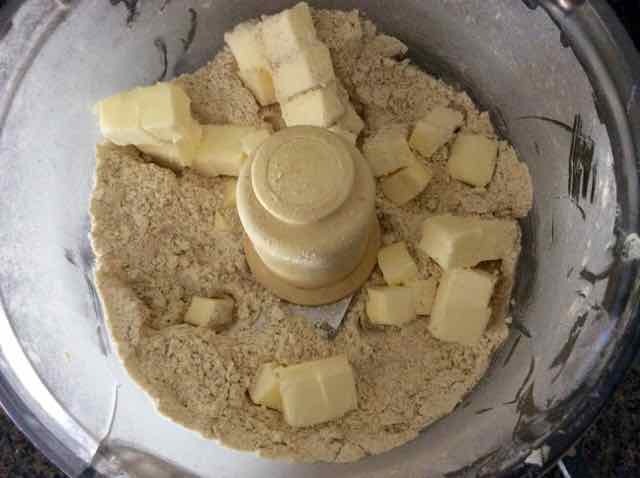 After the butter has been pulsed into the flour. 4) Add the egg and pulse or mix in. Adding the egg to the butter and flour mixture. 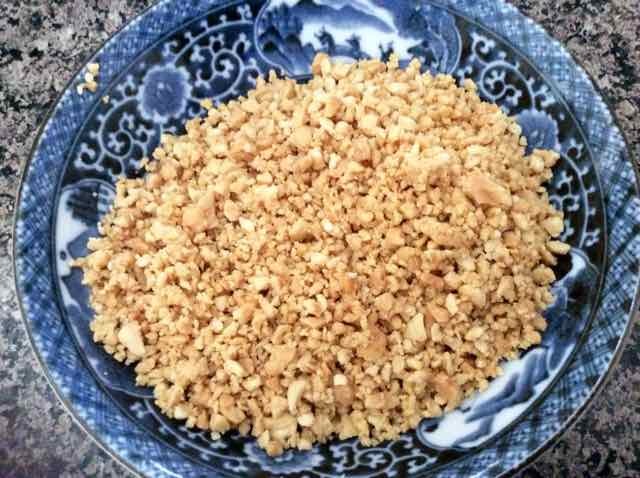 Crumbly mixture after the egg has been pulsed in. 5) Stir in the chopped peanuts by hand. I chopped the nuts in a small nut grinder. 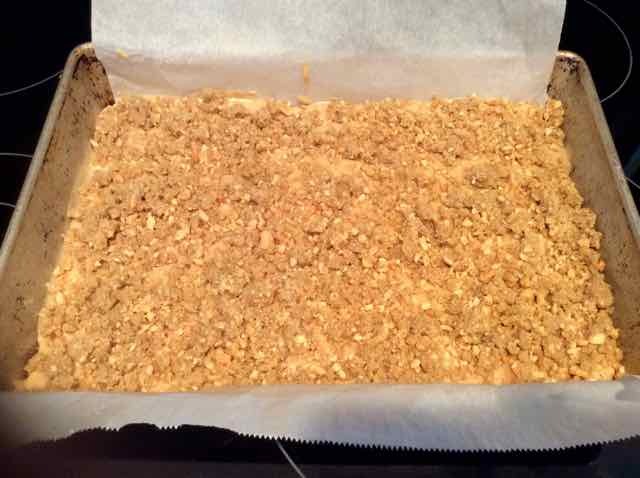 6) Press half of the crumbs on the bottom of the prepared pan. Reserve the other half. Half of the crumbs in the pan. The crumbs after being pressed on the bottom of the pan. 7) Bake the crust for 15 minutes or until lightly browned. The bottom crust partially baked for 15 minutes. 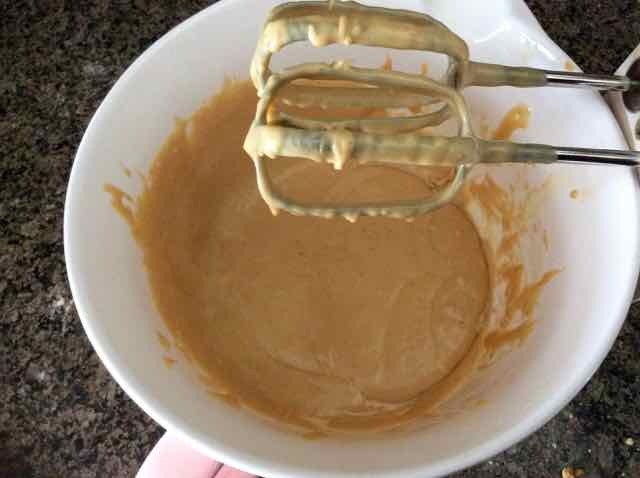 8) In a bowl add the peanut butter, condensed milk and vanilla and mix well. 9) Spread the peanut butter mixture over the partially baked crust. 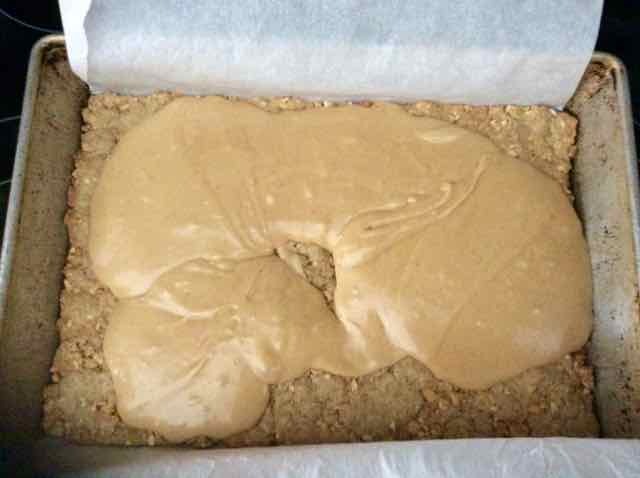 The peanut butter topping poured over the bottom crust. The peanut butter filling spread out over the crust. 10)Sprinkle the remaining half of the crumb mixture evenly over the top. 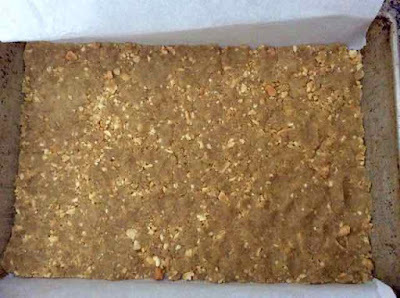 The remaining crumb mixture sprinkled over the top of the peanut butter mixture. 11)Bake 25 minutes or until lightly browned. 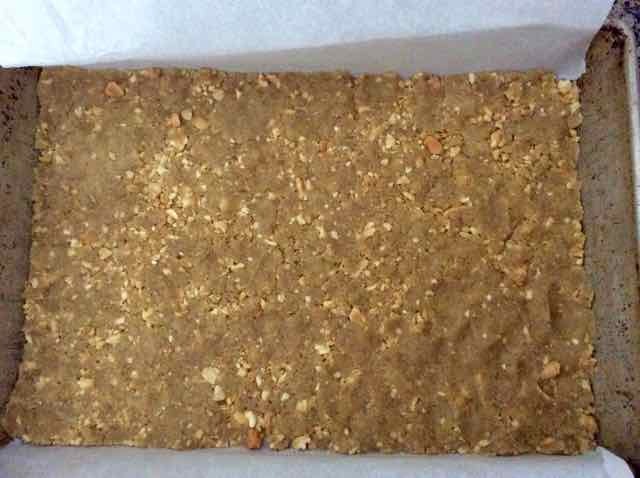 The Golden Peanut Butter Bars after they are completely baked. 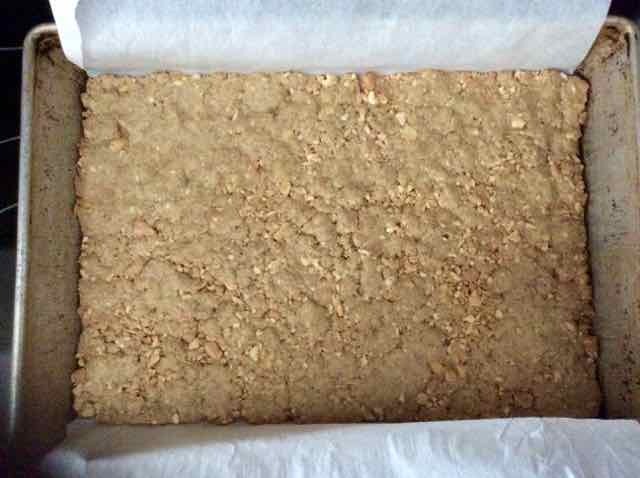 12)Cool before cutting into bars of the desired size. I prefer to eat these completely cooled rather than warm. GLUTEN FREE GOLDEN PEANUT BUTTER BARS Makes one 9” x 13” pan which can be cut into 1-3 dozen bars depending upon your preference INGREDIENTS 1 cup Sorghum Flour ½ cup Tapioca Flour ½ cup Chick Pea Flour ½ tsp. Xanthan Gum ¼ tsp. 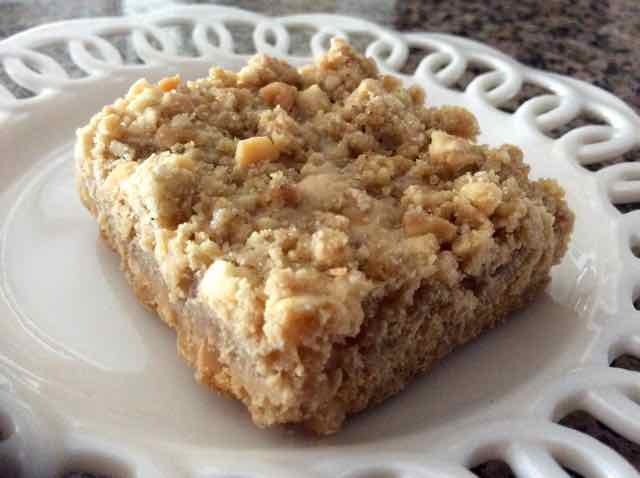 Sea Salt ½ cup Brown Sugar - packed ½ cup Unsalted Butter - cold Cut into pieces 1 large Egg ½ cup Creamy Peanut Butter - unsalted - I used a brand with only peanuts as the ingredient 1 tsp. Vanilla Extract 1 can/14 oz. Sweetened Condensed Milk 1 cup/5 oz. Roasted Peanuts - Unsalted - Chopped DIRECTIONS 1) Preheat oven to 350℉. 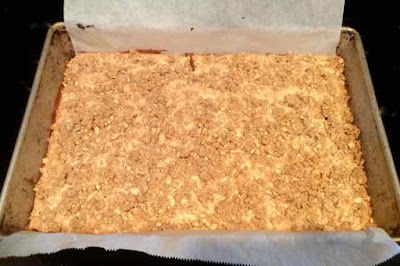 Prepare a 9” x 13” pan by lining it with parchment paper. This makes it easy to remove the bars and also protects the pan from cut marks if cutting them the pan. 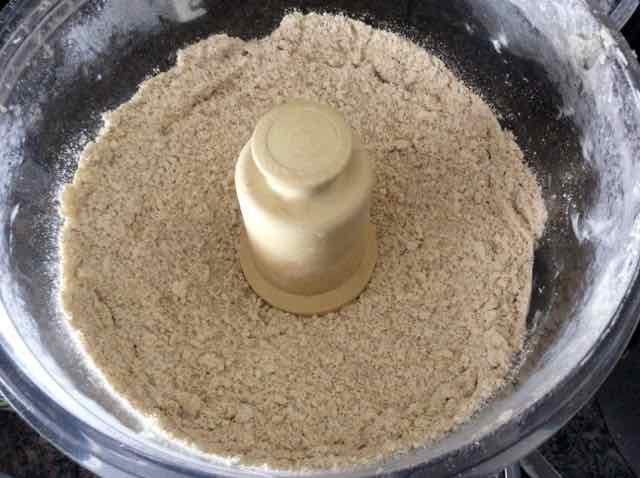 2) In a bowl using a pastry blender or in the bowl of a food processor add the flours, xanthan gum, salt and brown sugar. Stir or pulse together until well mixed. 3) Add the pieces of cold butter and blend with the pastry cutter or pulse in the food processor until the mixture resembles coarse sand. 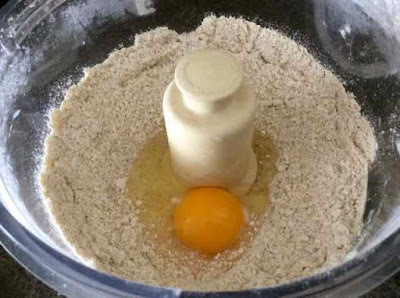 4) Add the egg and pulse or mix in. 5) Stir in the chopped peanuts by hand. 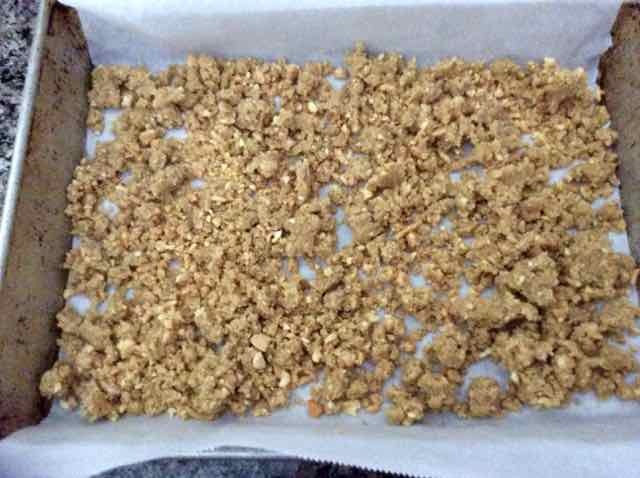 6) Press half of the crumbs on the bottom of the prepared pan. Reserve the other half. 7) Bake the crust for 15 minutes or until lightly browned. 8) In a bowl add the peanut butter, condensed milk and vanilla and mix well. 9) Spread the peanut butter mixture over the partially baked crust. 10) Sprinkle the remaining half of the crumb mixture evenly over the top. 11) Bake 25 minutes or until lightly browned. 12) Cool before cutting into bars of the desired size. I prefer these completely cooled rather than warm.